Tangerellas are a type of fairy that tend to be quite vain. In fact they may be one of the most vain creatures in the whole of the magical world. Due to their vanity most Tangerellas do not believe that humans or most magical creatures are worth enough to peer upon their beauty. They would not see this as prejudice or mean in any way. The fairies would merely see it as a fact of life and it their duty to guard such great beauty as a dragon would guard treasure. Because the fairies guard their appearance from ordinary eyes, not much is known about the details of their appearance. However, I will list for you what we do know. Although not all of the list can be taken as fact. Some of the facts may have more legend about them than truth. Tangerellas are small as you would expect most fairies to be. They tend to be the average height of about 5 to 8 centimeters tall. 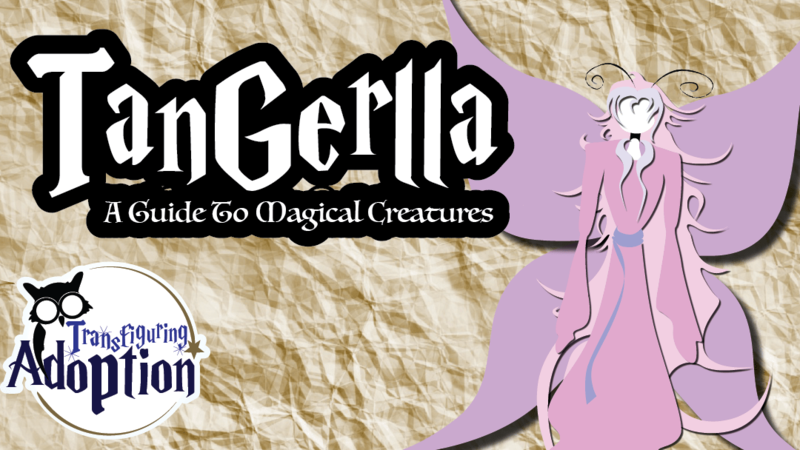 Tangerellas have only been known to be females with transparent wings that match the height of the fairy. The fairies are quite modest in dressing themselves. Clothes for a Tangerella are seen as firstly a tool to keep their beautiful bodies guarded from the world. The typical Tangerella clothes herself in clothing fashioned from only the smoothest flower petals. They tend to wear full length dresses. Some choose to wear jewelry but many Tangerellas don’t believe in wearing jewelry. If they are already so beautiful, there is no need for earrings and necklaces. The hair of a Tangerella is exceedingly long. The fairies believe that cutting their beautiful hair is a crime. One can tell the difference between a young or mature Tangerella by the length of the hair. A fully mature Tangerella could have hair that is almost 10 centimeters in length. The Tangeralla is magical in its very existence. They can fly and communicate with most animals. 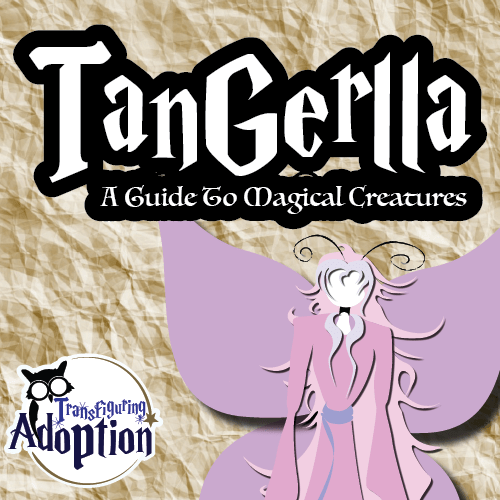 While Tangerellas wish to guard their beauty from ordinary human eyes, they magically owe their appearance to human children. The youth and beauty of a Tangerella are magically maintained forever only if the fairies sleep next to a human child nightly. It seems that the energy and beauty of a child magically invigorates a Tangerella each night. In fact a Tangerella may only survive four nights without sleeping next to a child before they grow so old that they simply fade away. For centuries the fairies have come to make nests in little girls’ hair. Although some of the smaller and younger fairies will choose a little boy’s hair to nest in from time to time. A parent can always tell when there is a Tangerella in the home as their child will come to the breakfast table with a head full of tangled hair. There is really nothing to be done in this situation except for the child to learn to comb/brush his/her hair. Tangerellas are not born. They brought into being when a baby yawns for the first time. Tangerellas are mostly harmless. However, as some people found in the early 1800s the fairies can be hot-headed when people try to trap them. 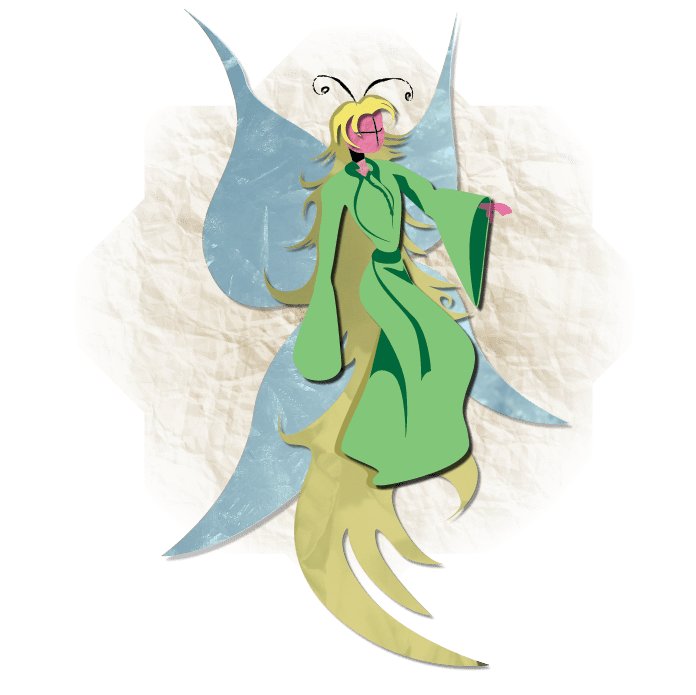 An angered Tangerella causes the fairy’s body temperature to rise enough to smolder papers and hair. Many women have the tale from that era of waking up to their hair partially scorched or letters and documents burned. Of course the public blamed unattended candles while people fell asleep awaiting a Tangerella to be caught. However, the whole idea of catching the fairies is insanity no matter as their magic allows them to phase through most solid materials. Have you ever found a flower petal by your bed? First consider yourself lucky to lay eyes on part of the attire of a Tangerella. Next consider yourself unlucky. Why?! If a nesting Tangerella discovers that a piece of their beautiful attire is in (what they consider to be) ordinary hands, they will automatically jump to the conclusion that the person tried to trap them. After all, they believe themselves to be the ultimate in beauty and grace and they would never fall prey to make an accident. Therefore, if you do not wish to fall victim to an angry fairy, the petal needs to be taken outside and buried immediately. The fairies would never bother with dirt and under the ground your secret will stay safe. When your kiddo wakes up in the morning sporting wild and tangled hair, comment that a Tangerella must have visited them last night. Remind them that Tangerellas seek out beautiful little girls and boys to magically stay pretty. Thus, it must be true that they are beautiful/handsome. We did this with our daughter. It’s a fun way to explain the wild morning hair and one more way to tell them how great they are. After all, if they have been through trauma in the past they may have never been told that they were gorgeous. They may even have been told that they were ugly. Before your child wakes up, lay a flower petal by their pillow. After breakfast make your way to their bedroom and alert them to the petal. As stated above, the petal must be buried to avoid an angry fairy. What’s the point of this? It’s mostly good fun. However, it also gives you and your child time to work on a silly project together that doesn’t have to take up much time at all. 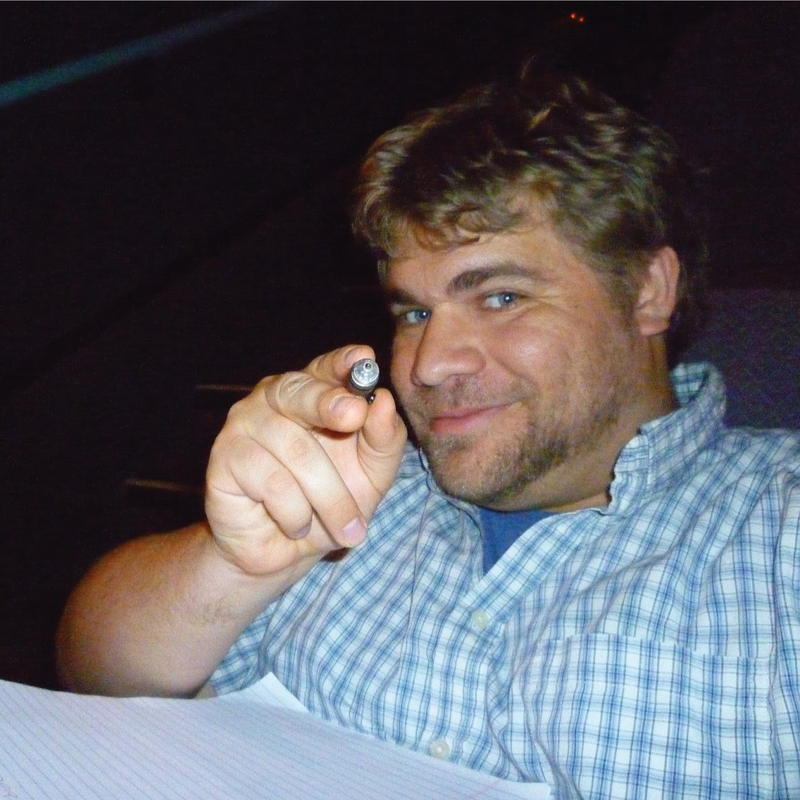 You’re working together and you then have a fun story to share with each other for years to come. Our kids were survivors of rough situations, and they didn’t have time to learn how to play. We would show our 23 month old a toy car and would merely get a confused look across his face. Even our five year old daughter would destroy rather than use them for games of make-believe. They would follow us around the house aimlessly. Our children needed to be taught how to play, and the adults needed to show them how to pretend. Dr. Karyn Purvis, a leading researcher and advocate in the field of working with foster and adopted children, emphasizes the importance of “playful engagement” with “children from hard places” in order to connect and to build trust. This is an excellent way to do that! As I already mentioned, our children were dealing with issues of survival early on instead of playing. Many of us would consider it a crime to rob a child of that magical time when they are young and everything is possible. Discovering magical creatures around the home allowed our children to daily reclaim some of their lost childhood. Why do some girls wake up with tangled hair? Why are there creaking noises around the house at night? Our children enjoyed these creatures so much. I can’t prove it, but I suspect that a couple of them even eventually caught on to the game. However, they continued to pretend for a good many years. 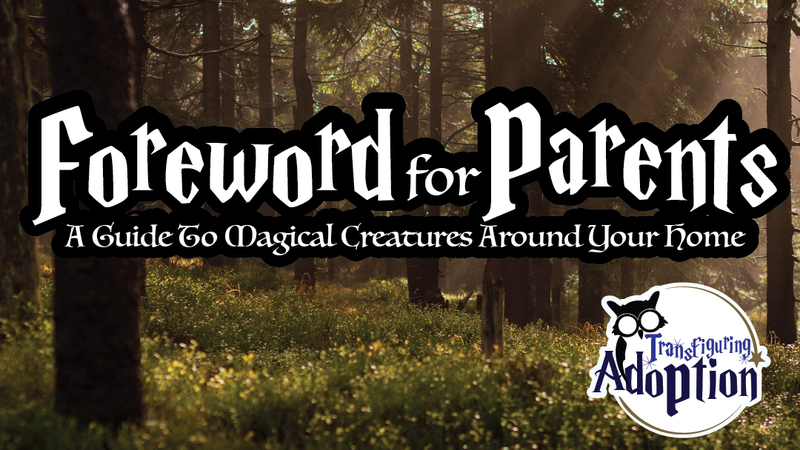 Even as most of our kids are teens, they still have great fun talking about those magical creatures that became a part of their lives. What Did Counselors and Other Professionals Think? As with most children in the foster care system, our kids were expected to see several therapists, counselors, and doctors quite frequently. It was always interesting to have a counselor call me back to their office and explain to them why a child was talking about little folks living in the walls of a house or finding a Dipsy Toad for good dreams at night. While the explanations always began awkward, many professionals complimented our household on our imaginative creatures that explained everyday phenomena in a playful way. Therapists and doctors were not the only people that heard about our creatures. Friends, family, and other foster parents were curious about these creatures. We have been asked several times to write about these animals so that other families can use them around their homes. Here is your chance to bring the magic of pretend into your child’s life and create wonderful memories that you’ll talk about for a lifetime. 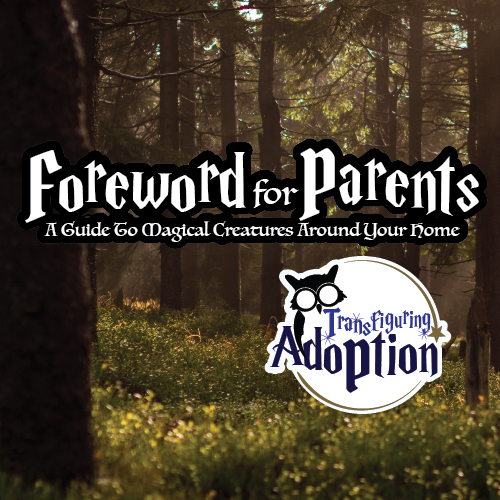 Read about the magical creatures in our guide with your child. You’re going to have to model the pretend for your child by talking about the creatures amidst everyday life. You might think it’s difficult to pretend yourself. However we have tried to do some of the thinking for you to get the ball rolling. Participate in the suggested activities we have included at the end of each creature’s description. When your child gets to the age of moving past belief in magical creatures or when they discover that it’s all a game, it’s OKAY. It has been sad to have to tell each of our kids that Santa Clause does not exist. However, we have told them that adults like to play, too. We have then invited them to help us make Christmas magical for other little children by continuing the pretend in a small child’s presence. Foster and adoptive kids know that the world is full of strife, BUT you can show them that it is a fun world as well. Please add fun games and events to our guide as you pretend with your child. Make sure to comment in the blogs about your ideas. You will help other parents who are participating in the fun.